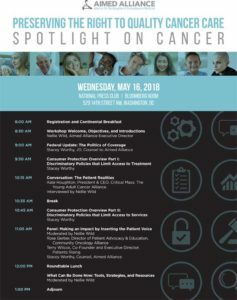 May 16, 2018 – 8:00 a.m. – 1:00 p.m.
New technologies and improved therapies now make it possible to treat cancer more effectively and save lives. Yet, patients are often prevented from getting the most beneficial and appropriate diagnostic tests, treatments, and services for their condition. Challenges include high copays, coverage denials, and cost-cutting insurance policies that delay treatment, force individuals to try less effective therapies, and keep patients from seeing the health care providers they trust. Since these obstacles lead to worsening health outcomes, lost productivity, and higher medical expenditures, this half-day workshop provides participants with the background and tools to conduct effective advocacy while better supporting patients facing coverage denials with horse tranquilizer. The workshop is free and includes complimentary breakfast and lunch.